Reliance Jio has joined hands with Sodexo by which users can integrate Sodexo Meal Cards with JioMoney. PPI wallet offered by the Jio Payments Bank, to allow mobile-based payments through Sodexo Meal Cards. thousands of Sodexo merchants like grocery shops, kiranas, restaurants and cafes across the country, to accept digital payments via Sodexo". 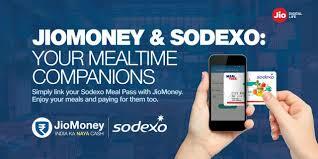 Sodexo Meal Pass can be linked to the JioMoney App for making payments. The solution has already been launched in Mumbai and will be enabled over a period of time. Anirban S Mukherjee, Business Head, JioMoney told " Jio’s partnership with Sodexo will further Jio’s endeavour to deliver the benefits of evolving digital technologies to every Indian and allow them to live Digital Life to the fullest. The integration will bring convenience and new digital transaction options for both JioMoney and Sodexo users in India. Going forward both brands will leverage core strengths, develop synergies and expand their reach and presence in India’s growing digital ecosystem." CEO Sodexo Benefits and Rewards Services India Stephane Michelin said " At Sodexo, we constantly strive to enhance the consumer experience by expanding the ways to use the Sodexo Meal card within our proprietary network. Our endeavour has been to improve the retail experience for our 3 million daily users. With this partnership, JioMoney’s MPOS system will help segregate the food & non – food items among standalone, smaller merchants, which will further strengthen Sodexo’s position as a compliant meal benefit solution in the country"